So we kicked the surveillance state in the shins a little bit yesterday. On Saturday, December 7, 2013, two carloads of activists drove to the NSA headquarters at Fort Meade to demonstrate against the U.S. surveillance state. 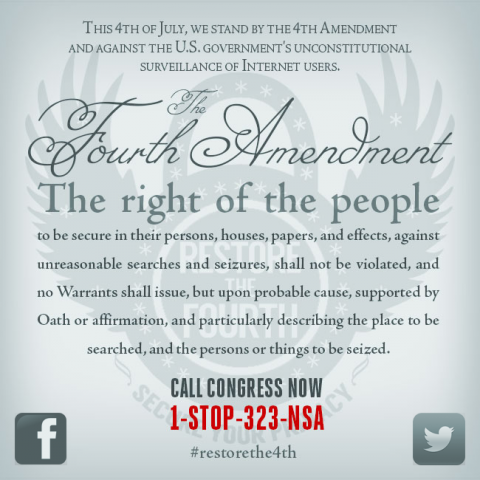 Save America – Close the NSA. The action, organized by the Bill of Rights Defense Committee with activists from Code Pink, Restore the Fourth, and the Montgomery County Civil Rights Coalition, helps kick off similar protests around the country leading up to the Bill of Rights Day on December 15th. Also, see The Consent Chronicle’s petition to reform the Electronic Communications Privacy Act by requiring the IRS, FBI, DEA, and local law-enforcement agencies to obtain warrants for E-mail spying. The petition is on White House site, so you need an account to sign: https://petitions.whitehouse.gov/petition/reform-ecpa-tell-government-get-warrant/nq258dxk There is a goal of 100,000 signatures: they are just past halfway, with 57,000+. Please help! You are currently browsing the Get FISA Right blog archives for December, 2013.